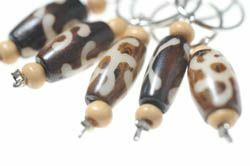 Set of 5 hand-beaded African bone stitch markers. These decorative little Stitch markers have been hand made at Iziko lo Lwazi adult literacy project in Cape Town, South Africa. Fair trade stitch markers are hand-made, attractive and useful items, of benefit both to the user and the maker; they also make ideal gifts for your knitting friends!